Maps can transport us, they are filled with wonder, the possibility of real adventure and travels of the mind. 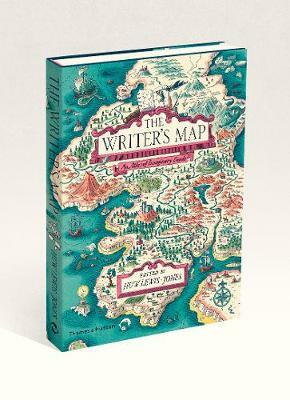 This is an atlas of the journeys that writers make, encompassing not only the maps that actually appear in their books, but also the many maps that have inspired them and the sketches that they use in writing. For some, making a map is absolutely central to the craft of shaping and telling their tale. A writer's map might mean also the geographies they describe, the worlds inside books that rise from the page, mapped or unmapped, and the realms that authors inhabit as they write. Philip Pullman recounts a map he drew for an early novel; Robert Macfarlane reflects on his cartophilia, set off by Robert Louis Stevenson and his map of Treasure Island; Joanne Harris tells of her fascination with Norse maps of the universe; Reif Larsen writes about our dependence on GPS and the impulse to map our experience; Daniel Reeve describes drawing maps and charts for The Hobbit trilogy of films; Miraphora Mina recalls creating `The Marauder's Map' for the Harry Potter films; David Mitchell leads us to the Mappa Mundi by way of Cloud Atlas and his own sketch maps. And there's much more besides. Amidst a cornucopia of images, there are maps of the world as envisaged in medieval times, as well as maps of adventure, sci-fi and fantasy, maps from nursery stories, literary classics, collectible comics - a vast range of genres. Huw Lewis-Jones is a historian of exploration with a PhD from the University of Cambridge. He was formerly Curator at the Scott Polar Research Institute, Cambridge, and the National Maritime Museum, London. His books include The Conquest of Everest (winner of the History Award at the Banff Mountain Festival), The Crossing of Antarctica and Across the Arctic Ocean. He is the author, with Kari Herbert, of the bestseller Explorers' Sketchbooks.